Tattoos represent one crazy form of body art, which is beyond limits or rules. The excruciating body adornment is not restricted to only few body parts, but fanatics can go on getting inked all over. So, where possibly can one get a tattoo, where it is closest to one’s heart? Well, what better location than chest. However, the decision has to be backed with immense passion and conviction. 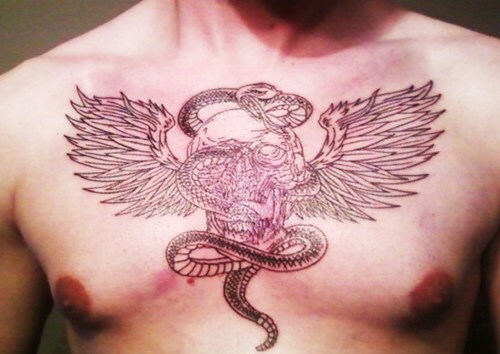 A tattoo enthusiast would like to seek an original design, when deciding to ink his chest. However, you must not also miss the mind-boggling ideas, which might get you your ultimate tattoo of the life-time. When inking on chest, you may go for large and bold designs representing fiery expressions. Unless, you wish to get only a decent and fashion-friendly tattoo, a chest tattoo ought to look astounding and eye-popping. Chest tattoos are exclusively meant for those who like it audacious, loud and simply insane. If you liked our selection, perhaps these other posts will interest you too, Groovy Cover Up Tattoos, Black And White Drawings, Asian Posters, and Food Art Masterpieces.